When she spotted the silver silhouette of the state of Maine dangling from a necklace in a Portland jewelry store window, then-Attorney General Janet Mills had a premonition. 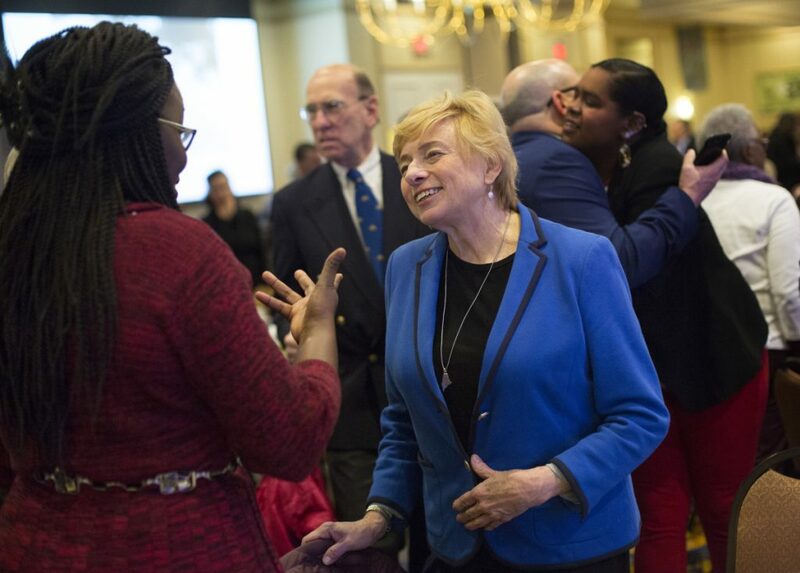 Janet Mills said that when she bought her Maine necklace, she had a thought that it might become “my lucky talisman.” A year later, Mills was elected governor. “I was visiting Portland and the necklace caught my eye in a shop window. I thought ‘Oh, I like that!’ so I went inside and learned the piece was made by a silversmith named Elizabeth Prior, who used to live in my hometown of Farmington,” Mills said. She bought it and a year later, won the race to become governor. The $125 piece has since become a favorite. Mills wears it often, including to her swearing-in and the annual Martin Luther King Jr. Day celebration in Portland this week. “I have been wearing it ever since and am almost a little afraid to stop wearing it now,” the governor said. The purchase also has been lucky for Prior, who along with three other artists, operates the Fore River Gallery on Market Street in Portland. Prior said the publicity the necklace has received has increased sales and led to new orders, although she declined to provide specifics. Prior, who spent part of her childhood in the state, went to the Maine College of Art and has been back in Maine full time since 1987, said she shifted to more Maine-centric pieces after the Great Recession hit a decade ago. 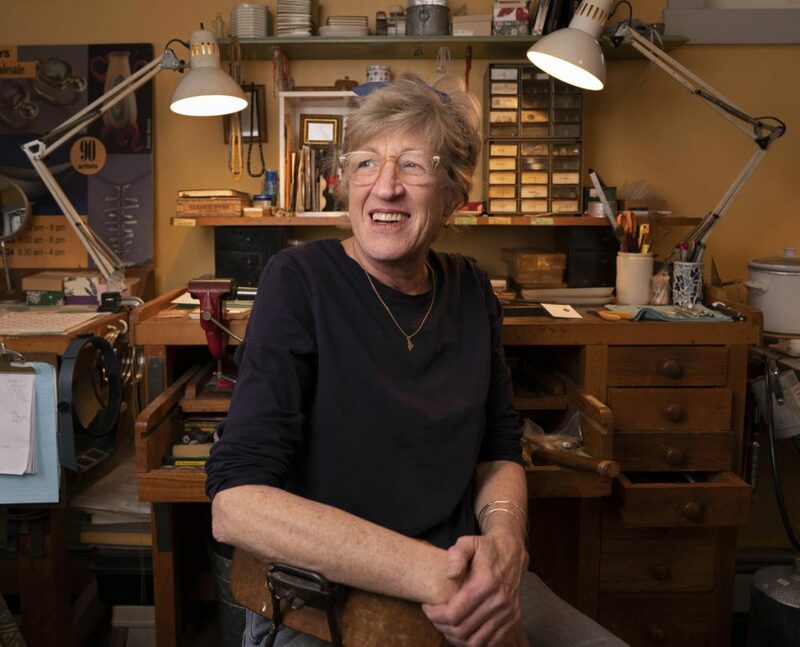 Pictured at her South Portland studio, jewelry maker Elizabeth Prior says she wasn’t in the Portland gallery when then-Attorney General Janet Mills bought her necklace back in 2017. Publicity about the piece since then has led to increased sales. “I had to come up with something that was not so much in the art world,” Prior said, and focused on pieces that would help Mainers and visitors connect with the state. 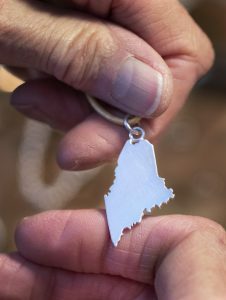 Some pieces have the longitude and latitude of a client’s favorite spot in Maine, for instance, and she also created jewelry adorned with a zip code or just the state’s 207 area code. Prior made the first piece in the outline of the state in silver in 2016 and it sold well, she said. There are three sizes, and Mills had bought the largest one. “It’s about an inch and a quarter long, from Madawaska to Kittery,” Prior said, describing the piece. Prior said she wasn’t in the store when Mills visited in late 2017, but started to hear from friends who said they had seen Mills, by then running for governor, wearing the necklace. One friend, former Cumberland County District Attorney Stephanie Anderson, said she had lunch with Mills. Mills admired Anderson’s earrings, made by Prior, and Anderson admired the necklace. On election night, Prior posted a picture of the victorious Mills, wearing – of course – Prior’s Maine necklace. “Find a picture where she doesn’t have it on,” she said. Mills contacted Prior after the election, asking for similar pieces for members of her transition team. She put together a rush shipment of 29 pieces – necklaces, pendants, lapel pins, rings – and sent them along to the governor-elect. Prior declined to say how much the order was worth. One friend who had seen the election night picture on Facebook suggested, “All women in Maine should wear it in solidarity” with the state’s first woman governor. Victoria Hugo-Vidal, who writes a column called The Maine Millennial for the Portland Press Herald, said she decided to do that on her own. “I’m not normally a big jewelry person, but I really liked Maine in silver,” when she saw Mills wearing it, Hugo-Vidal said. She looked around and found out that Prior made the pieces and got her own necklace, Hugo-Vidal said. And yes, it’s meant to send a message. “Fashion is always a political expression; it’s just ignored because it’s women’s expressions,” she said, adding that she’s not sure how many people will pick up on the message of support. DID SHE VOTE FOR MILLS? Prior said the interest in the necklace came at an odd time for a jeweler. After the holidays, jewelers tend to draw down on the stocks of metals they have on hand because demand for jewelry slackens and it’s a few weeks before they focus on Valentine’s Day business. But Prior plans to use what’s normally a bit of a down time to focus as much as she can on the Maine necklaces because she has orders in hand. Prior strongly defends the quality of her work over shifting political winds for her success with Maine necklaces.